Industrial buildings typically have large areas that are designated for manufacturing. We find that many industrial complexes have multiple buildings and roof types with a wide range of ages as the operation expanded over time. Overall, these industrial buildings tend to be a lot older in our area of the country and tend to deteriorate rapidly over time because of extremes in weather. As a whole, industrial tenants seem to report fewer leaks. Often in industrial settings, leaks and problematic conditions tend to go unnoticed or unreported. They also can be allowed to get worse before the managers and owners are informed. Unfortunately, this can become a greater concern because roof replacement typically can be more costly because of the total square footage of an industrial building. Also, there may be higher costs related to the scope of work involved due to the density and type of specialized equipment that populates the roof. Often, there is specialty equipment located on the roof deck. This equipment may need periodic servicing. 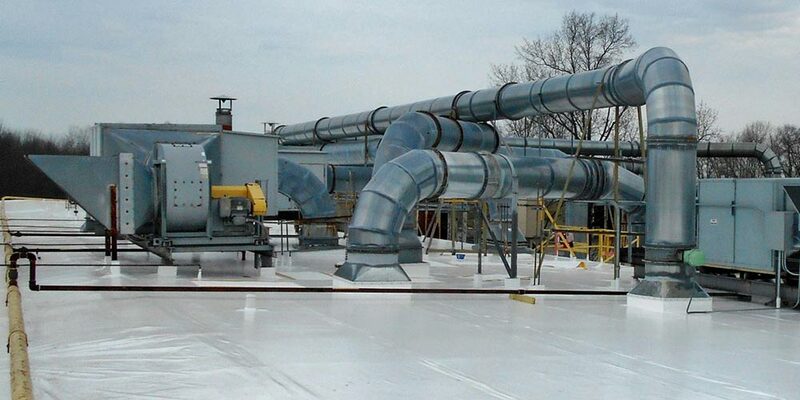 Some manufacturers have discharges that may accumulate on the roof membrane. Some of these include grease, oils and other contaminants. For most roofing membranes on the market now, this can reduce years of service life from a roof membrane. 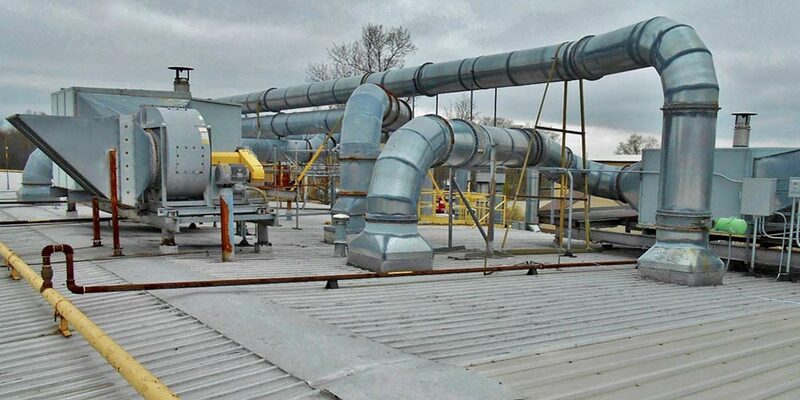 A “before” photograph of an industrial roof with many penetrations and equipment. This is an “after” photograph showing the many custom flashings for the many penetrations. When Umbrella Roofing Systems, Inc. installs a Duro-Last prefabricated roof, over 85% of the seams can be completed in a factory-controlled environment before the roofing system is delivered to the job site. By eliminating most of the on-site seaming, Duro-Last dramatically reduces the potential for leaks. Also, this advantage makes installation faster, quieter and easier. The custom-made flashings are prefabricated to fit perfectly in the field. This dramatically reduces the potential for leaks. Most importantly, by using Umbrella Roofing Systems, Inc., there is less of an impact on daily business operations while a new roof is being installed. Our customers find that, with a Duro-Last roof installed by Umbrella Roofing Systems, Inc., they receive reliable, long-term performance, with virtually maintenance-free durability.